Get the most in HD from DISH Network. 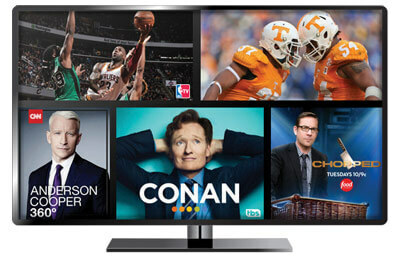 DISH has more High-Definition channels featuring the best in sports channels and movies. Only DISH gives you 100’s of HD channels at NO EXTRA COST! With HD Free for Life you get true 1080p HD and 4K Ultra HD whenever it is available for no extra charge. Watch all your favorite shows and networks like A&E, AMC, Discovery, Syfy, TBS and many more in crystal clear HD with DISH TV. DISH is the best in TV, and now with so many movie channels in HD for free, DISH is the best in film as well! Every premium channel is available in HD, so are your three free months of Showtime and the Dish Movie Pack! In addition, the best film channels also come to you in HD for no extra charge. See classics on TCM in HD, catch the best indie films in HD on IFC, blockbusters on TNT HD and more! HD is short for High definition. HD TV offers a more detailed image by packing more pixels into your display. 1080p HD means that you get 1,080 horizontal lines of vertical resolution. A 4K Ultra HD display is composed of over 8 million pixels. How can I get HD TV with DISH? It's easy. If you sign up for America's Top 120 or above, you get HD Free for life. Can I record HD shows and movies? Yes. The Hopper lets you record up to 16 HD shows/movies at once.